With a recent and controversial change in the law making squatting a criminal offence, the media has been awash with opinion pieces on the matter. Alongside all the polite debate and raging arguments, there has been a very public renewal of interest in the security of properties which are vacant, for however long and for whatever reason. Property Property Property are pleased to present the following guest post from the nice folks at Safe Site Securities, who have some advice about leaving your property vacant. Rent in London can take a chunk out of your monthly income; so you don’t want to be paying out to replace stolen objects or repair broken property. When your property becomes vacant, it is paramount to ensure that you don’t get caught out when it comes to insurance. The majority of standard property insurance policies only continue to provide cover for a maximum of 30 days should the property become unoccupied, with the most generous policies only allowing up to 45 days. Why is a Property Vacant? Both residential and commercial property can become vacant for a number of reasons. It could simply be a time lapse between tenants for a landlord, or a death in the family may leave a property vacant whilst probate is administered and the property is left until prepared for re-sale, and sometimes property owners simply aren’t able to manage resulting in properties lying dormant. A job relocation could result in a property lying vacant whilst a buyer is sought, and many holiday homes are only occupied during certain times of the year. Both professional and amateur property developers regularly buy a renovation property at auction which may lie empty for many months before it is ready for occupation once more. Why bother with Specialist Insurance? The answer is simple – to protect your assets. Vacant properties are at constant risk from vandals, arsonists, thieves and decay. Whilst at first glance opting not to take out vacant property insurance may seem a risk worth taking, spend a few moments thinking about the consequences if something does go wrong. Left unnoticed and not dealt with, prolonged water damage can ruin the fabric of a building. Whether the source is simply a blocked drain or missing roof tile water can quickly penetrate walls and joists potentially resulting in hefty repair bills. 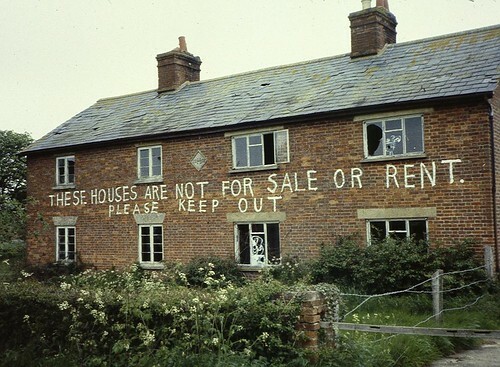 Any obviously empty property offers a great temptation to both vandals and squatters. The damage caused by such criminals can be endless – from smashed doors and windows, to fires, theft of fixtures and fittings, graffiti and the build up of debris and detritus. The eviction of squatters can be both a lengthy and costly affair, and the bill from professional repairs and a thorough cleanse of a property really can run into thousands of pounds. Vacant Property Insurance comes with a host of conditions that must be adhered to for the cover to remain valid. Some of these can be considered common sense, such as ensuring adequate locks are fitted to all doors and windows. Other conditions are more extreme, such as the requirement to ensure the property is inspected on a regular basis for signs of damage, decay and developing problems, and any concerns are both recorded, reported and dealt with swiftly. There may be a requirement that surrounding land is kept maintained, as well as simple tasks such as ensuring a letter box is regularly cleared. If your property is to remain vacant for a long time period, it pays to call in the experts. Not only will this enable you to obtain the highest levels of vacant property insurance, it will ensure that your property is far more likely to remain safe and secure. Security specialists can not only advise on securing doors, windows and other access points effectively, they can carry out enhanced security measures such as installing steel security screens and mobile security alarms. If your empty property isn’t local to you, reputable security firms can be a god send, able to carry out professional property inspections both internally and externally weekly or bi-weekly as required by your insurance firm. Whilst all this might seem a little extreme, in my mind it makes perfect sense. Property is money, why risk it? Safe Site Facilities are empty property security experts, with extensive knowledge of the concerns and risks that property owners face with their uninhabited properties. SSF know that with a few simply deterrents and barriers, you could save many thousands of pounds in damages. Here at Property Property Property, we’re mainly concerned with estate agents and great property to rent and buy. But once we’ve helped you find your dream home and it’s yours to live in, you might be concerned with keeping it safe. Read on for some top tips on how you can guard your home from unwanted guests. As part of our Bodyguard Week to celebrate the debut of the West End adaption of The Bodyguard, today we’re going to look at home security. In the film, Whitney Houston’s pop star hires Kevin Costner’s bodyguard when she becomes the victim of a stalker. Hopefully you’re not at risk of receiving such unwanted attention, because a bodyguard might be a bit much. However, it still pays to take precautions and not to be careless when it comes to property security. Some choose to go all out and have special surveillance and preventive equipment installed. This can be a good investment if you live in an area that is particularly at risk; however, always assess that what you’re buying or the work you’re having performed is absolutely necessary and a security company isn’t merely exploiting your concerns for their own profit. It’s easy for many, when it comes to their and their family’s security, to go overboard, out of fear. Do your own research and make an informed decision. So below we look at some easy tips to take on board when it comes to making sure your home is secure, and that you’re safe. On moving into a new property, whether buying a house or flat, change the locks as soon as possible. You can’t always account for who owned the property in the past. Review your locks at least twice a year. Slamming doors or windows, as well as general wear-and-tear might weaken a once-strong lock. Always hire a locksmith with good references to perform this work too. Get used to opening only a few windows so you don’t forget to close any when you leave or go to bed. If you live in a flat, make sure that you always close the main communal door, as you come and go. Some can be quite heavy and don’t always close properly. Listen out for the ‘click’ it should make. If it has been left open, as if someone is moving furniture, check ten minutes later if it is still open. If no one is around, close it yourself. If you live in a home with a porch or gate, always keep both locked as it provides an extra defence. Get to know your neighbours. It’s not so much about being nice but to know who lives where, the rough times they come and go, and most importantly, who they are. It can be very easy to be anti-social and concentrate on your own business. Unfortunately, this can lead to incorrectly assuming that a potential intruder is a neighbour when you might be allowing an intrusion to take place. Even if you don’t wish to become close friends with your neighbours, get a good idea amongst yourselves who lives where and any regular visitors, they receive like family. If you can befriend one or two neighbours, you’ll have someone nearby to keep an eye on your home when away. If you live or rent in London, Manchester or a similarly large city, where crime is often higher on average, you may find it difficult to tell who is hanging around suspiciously, and who is simply passing by. This can be aggravated if you live on a main road with a lot of foot-traffic. Is anyone walking past more than a normal number of times that you know doesn’t live close by? Keep laptops, tablets, mp3 players and anything mobile and expensive out of sight from windows. This might simply involve putting them in a desk-drawer. It can also be very easy to keep car keys and wallets as you come in to the property, like in a keybowl. Intruders can use an instrument to pluck these up through the letterbox, or simply find what they want quickly if they choose to break the lock and enter. It’s common to keep ladders or garden furniture lying around outside your house when and where you need it. However, these can all be utilised by professional intruders to get into your home. Are there any ledges or walls around your property, which can easily assist someone in reaching a window? Ornaments or other objects might also be used to break a window or lock, so keep this in mind when decorating the exterior of your home.